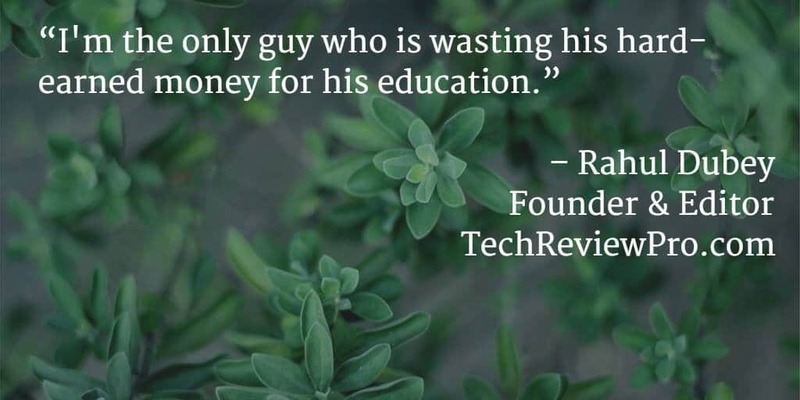 Hello, I’m Rahul Dubey, founder, and owner of TechReviewPro.com. First of all, let me thank you for being here. 🙂 It is really a pleasant experience to see you at TechReviewPro. TechReviewPro is a modern technology blog specially designed for tech lovers. TechReviewPro mainly focuses on modern technology. We cover a wide range of topics including Android, iOS, Windows, Mac, Linux, etc. You are all set to enjoy free tutorials, tips, and tricks related to Blogging, WordPress, and various operating systems, software, apps, etc. We often review useful software, apps and consumer-oriented gadgets from a wide range of brands. But this doesn’t mean we represent any of these brands. Information provided here is just for the sake of readers awareness and based on some research and analysis. However, in some cases, affiliate links may be included. Read our Disclosure Policy. Rahul Dubey founded TechReviewPro on 1st of October, 2014. Later, his brother Abhishek Dubey joined him to put his hands together for adding more quality and value for the blog readers. Rahul is a quick learner and blessed with the natural talent of good writing skills. He started his primary education as a topper of his class and later, he got a habit of being a class topper. He enjoyed some initial fame of being featured in the school magazines and local newspaper due to his writing work. Nothing changed until he realized, he is wasting his parents’ hard-earned money for valueless education. At 16, he took a bold decision to start writing for a living and started his first online start-up which was unsuccessful. The failure inspired him to realize that he is on the right track as being a loser was way better than being a topper. Although he failed, he learned some important lessons. He started enjoying it, challenged himself and started another online startup. Rahul succeeded in taking his start-up to unexpected heights within first few months and tasted some initial success building a 6-figure online business. He continued his education and graduated with a degree of B.Sc. in Computer Applications from one of the most reputed university of the state – Nilamber Pitamber University, Ranchi. Nothing has changed in education. The only difference is – I’m wasting my own hard-earned money instead of my parents. Now, he hates the Indian Education System. Currently, he is living a happy & cheerful life owning multiple blogs and leading a team of talented writers & developers. His quick success and ever helping attitude have provided him a good reputation in the blogging world as people consider him a source of motivation. Apart from blogging and professional life, Rahul is very kind-hearted, down-to-earth, reliable and helpful person. He respects every religion and values thoughts of every individual. He loves playing and watching Cricket & Badminton. He likes reading romantic novels, watching comedy movies or hanging out with friends in his free time. You may contact Rahul using Facebook, Twitter, Google+, LinkedIn or E-mail. You may also consider visiting our Contact Us page for any query or suggestion.